Free Gift Certificate Offer! Cyber Monday Deal! Cyber Monday is here and Moments of Magic Travel has a very special Disney Vacation offer! On Monday December 1st when you purchase a $500 Moments of Magic Travel Gift Certificate you will receive an additional $100 for FREE as our gift to you! 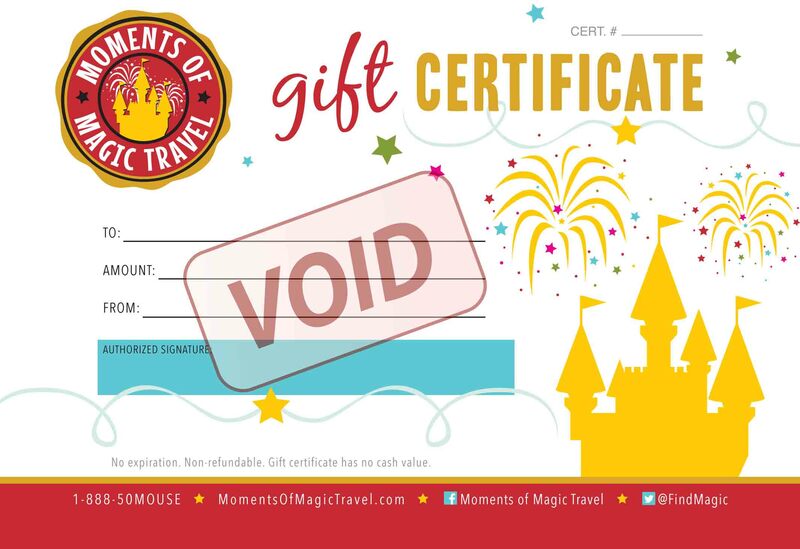 * This special offer certificate can be used on any NEW Walt Disney World Vacation Package, Disneyland vacation Package or Aulani Vacation booked through Moments of Magic Travel! 1-888-50 MOUSE to take advantage of this offer before the stroke of midnight! *Restrictions Apply: One free additional $100 Moments of Magic Travel certificate offer per family. Only one special $100 Free offer gift certificate may be redeemed per Walt Disney World Vacation Package, Disneyland vacation Package or Aulani Vacation reservation number. Special $100 Free Gift certificate offer is valid only on NEW Walt Disney World Vacation Package, Disneyland vacation Package or Aulani Vacation Packages booked through Moments of Magic Travel from November 29th, 2014 through December 31st, 2015 only. Purchase of the Special $100 Free Certificate offer EXPIRES at 11:59pm on Monday December 1st 2014. Special $100 Free Certificate is not valid on previously booked Disney vacation packages. Special $100 Free Certificate is NOT valid on Disney Cruise Line vacation Packages or Adventures By Disney Vacations. 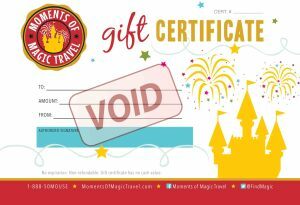 ALL Moments of Magic Travel Gift Certificates are valid on vacation packages ONLY- NOT valid on Disney ticket only purchases. One Special $100 Free Certificate offer per eligible package reservation. Special $100 Free Certificate Offer MAY be combined with vacation offers made by the Walt Disney Travel Company. Contact your Moments of Magic Travel agent at 1-888-50 MOUSE to purchase your Gift Certificate. May not be exchanged for cash or credit. Offer will be null and void if the vacation package is cancelled. Offer subject to change or cancellation without notice. This entry was posted in Adventures By Disney, Current Offers, Disney Cruise Line, Disney's Aulani, Disneyland, Walt Disney World and tagged Free Disney Gift Certificate on November 27, 2014 by Moments of Magic Travel. We have a little magic to share.. and we’ve decided to let it out from under our hat! For over a decade we have planned and booked Walt Disney World vacations for our friends and family. It has been so much fun to plan a trip and in many cases, to see the look on the face of someone who is visiting Disney for the first time! After 15 years of planning these trips right down to the very last detail, we have decided that now is the time to take that experience and let it grow. Welcome to the world Moments of Magic Travel! (This is the part where we take off our hats and confetti flies everywhere while fireworks blast in the background- can’t you just picture it!?). We hope you will take a moment to follow us here on our brand new blog- one that will obviously be entrenched in all things Disney. Join us on our FACEBOOK page to stay informed about our GIVEAWAYS and SPECIAL Promotions! Give our page a ‘like’ and you might just win a prize or two! The launch of Moments of Magic Travel is going to be fun- that much we can guarantee! Keep on reading below to learn about some of the many benefits of booking your next Disney vacation with Moments of Magic Travel. If you are planning a trip to any of the Disney Parks, Worldwide Adventures by Disney locations, or the Disney Cruise Line we hope you will give us a call- we promise you will find excellent customer service with a LOT of perks waiting for you on the other end of the line! For right now we are taking a cue from a beloved fairy tale- and holding on to faith, trust and pixie dust! Off we go! What is Moments of Magic Travel? Moments of Magic Travel is an authorized, licensed, bonded and insured full service Disney Vacation Travel Planning Service– in a nutshell, we do all the work planning your Disney destination vacation down to the very last detail at NO COST to our clients! That’s right- our services are completely FREE! Our job is to book your vacation package at the very best price possible -the same price as what you would pay if you called Disney yourself, but often for LESS because we consistently monitor each reservation to make sure our clients are getting the best offer from Disney. We book any Disney Destination Vacation package- including Walt Disney World, Disneyland, The Disney Cruise Line, Adventures By Disney, Aulani, and the Disney Parks in Tokyo and Paris! What else does Moments of Magic Travel do? When you call Moments of Magic Travel we will create a Disney Destination vacation that is tailored to your families needs. We handle every aspect of your Disney vacation planning- from deciding on which of the wonderful resorts to choose, to booking dining reservations and creating a customized time saving itinerary that will help you navigate the parks like a pro! How do you know so much about Disney? As an authorized Disney Travel Agent* the owner of Moments of Magic Travel is a graduate of Disney’s College of Knowledge! She has been planning Disney Destination vacations for over 15 years and spends a lot of time in the parks throughout the year! Her years of experience in all things Disney related will translate into a wealth of knowledge in planning YOUR Disney Dream Vacation! You can reach us daily from 8am to 7pm EST at 843-737-2994. You can email us at info@momentsofmagictravel.com or through the ‘Contact Us’ link on our website. If you are a client traveling in the parks, you will also have access to our text messaging service outside of regular business hours. We are 100% committed to your satisfaction and we will do everything we can to exceed your expectations! When you call during normal business hours us we will get back to you with a requested quote within one hour! Our website services are open 24 hours a day– all of you night owls can join us on-line anytime! You can find Moments of Magic Travel on-line at Moments of Magic Travel, on Facebook, Twitter- @Findmagic, Pinterest, Instagram and over on our blog which will feature great articles about Disney Destination Vacations, trivia and tips to navigate the parks like a pro! Be sure to ‘like’ us on Facebook to stay in the loop for our special offers and giveaways! Absolutely NOTHING. Our planning services are completely FREE to our clients! We will provide a written estimate of our vacation packages and once booked, you will receive your reservation number directly from Disney! Will you get me the best price for my Disney Vacation? ABSOLUTELY! Saving you money is our goal! We have knowledge of new discounts and promotions before the general public! We compare discounts to find the best deal for you and will modify your existing reservation to a lower price if one becomes available! We book your Disney Vacation package directly through the Disney Travel Company, so rest assured that your booking is safe and guaranteed! We also offer travel insurance policies on all of our packages which will help protect you in the event of an unforeseen travel emergency. At Moments of Magic Travel our mission is simple- We plan the magic- you create the memories! Give us a call and let us turn your dream of a Disney Destination Vacation into a reality! *Not an agent of the Walt Disney Company or it’s affiliates. This entry was posted in Adventures By Disney, Disney Cruise Line, Disney's Aulani, Disneyland, Walt Disney World and tagged adventures by disney, aulani, authorized disney vacation planner, disney, disney cruise line, disney travel agent, disneyland, walt disney world on October 7, 2013 by lesliedp.